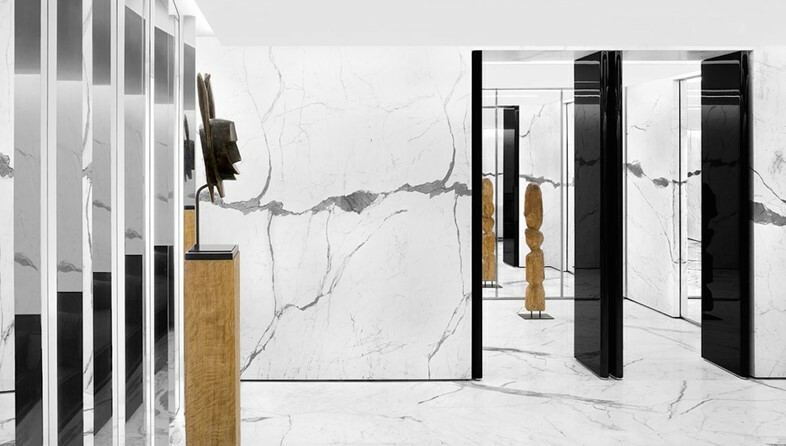 Saint Laurent's flagship store in Rue du Faubourg has recently re-opened its doors after months of renovation in line with the label’s ongoing rebranding plan. 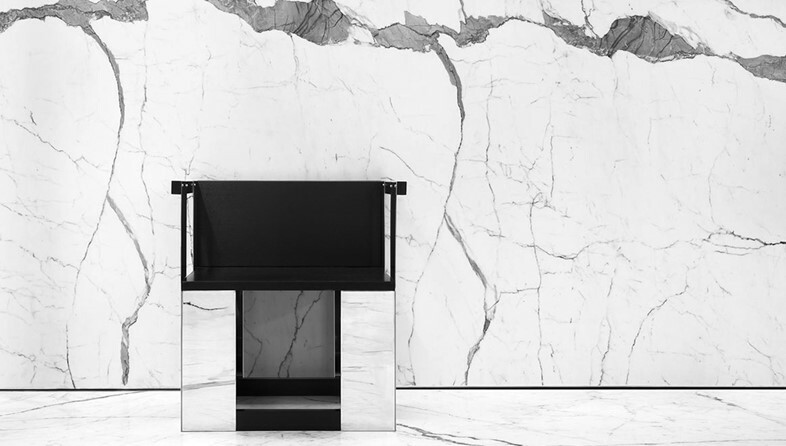 Although its architectural clarity and sleek monochrome designs are very much in tune with the house's minimalist aesthetic, the concept that creative director Hedi Slimane has developed for the home boutique is quite exceptional. 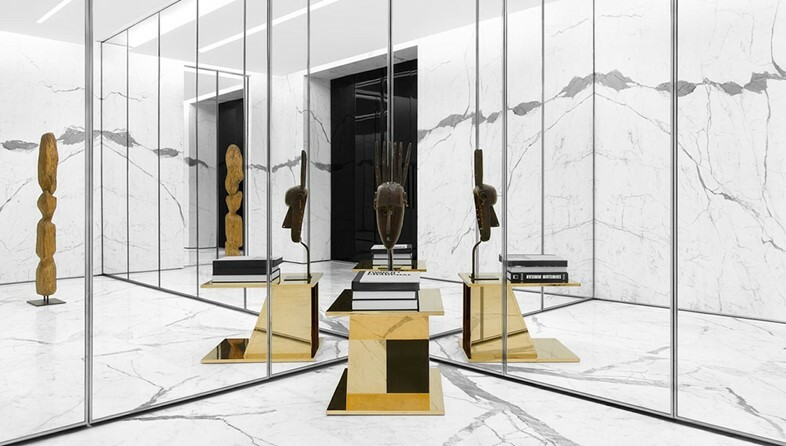 Contained within veined white marble and board-formed concrete, the 390m² space boasts floor-to-ceiling mirrors, metallic finishings, nickel-plated brass consoles and unique vintage pieces, including 1930s vitrines and a quilted black leather bench (alongside ornamental wooden Malian masks, a reference to Saint Laurent’s love for Africa). 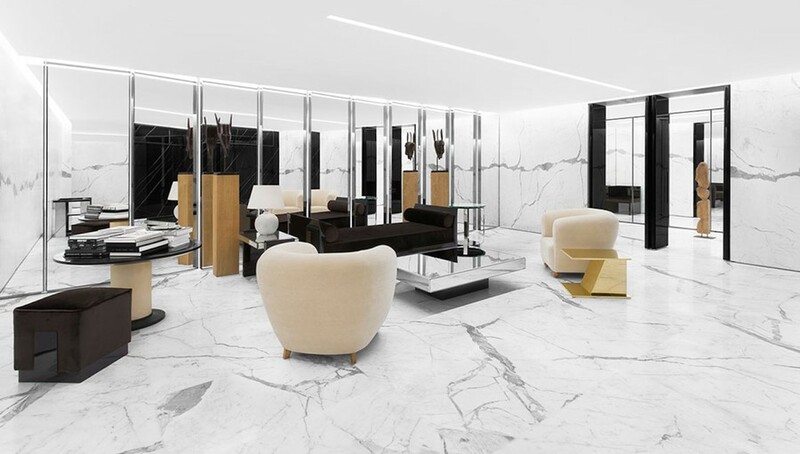 Something between a store and a museum, the ground floor is dedicated to the women's ready-to-wear collections, while the first floor holds the salons privés, accessed through a mirrored elevator. Amidst Art Deco furnishings and ethnic sculptures, here we discover the craftsmen behind Slimane’s handpicked vintage treasures. “What a lot of work to achieve simplicity!” is how Jacques Adnet once summarised his craft. A legend of modernist furniture design, Adnet is best renowned for his simple and elegant Art Deco creations. 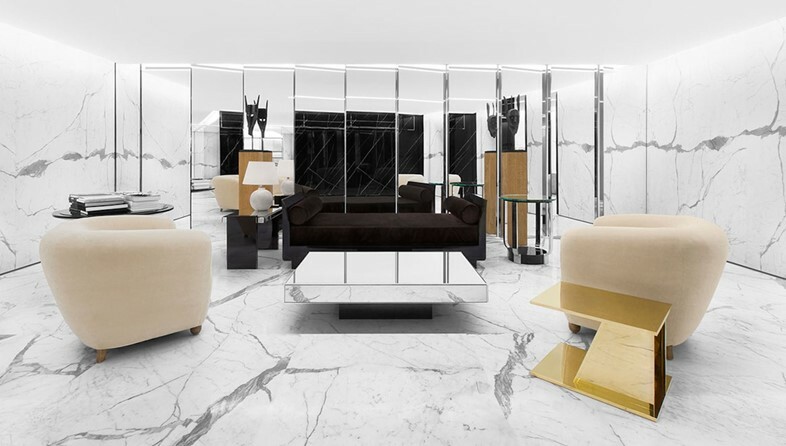 Combining noble woods and leather with brushed metal, smoked glass and mirrors, he was one of the first to integrate glass and steel into the building and decoration of furniture. 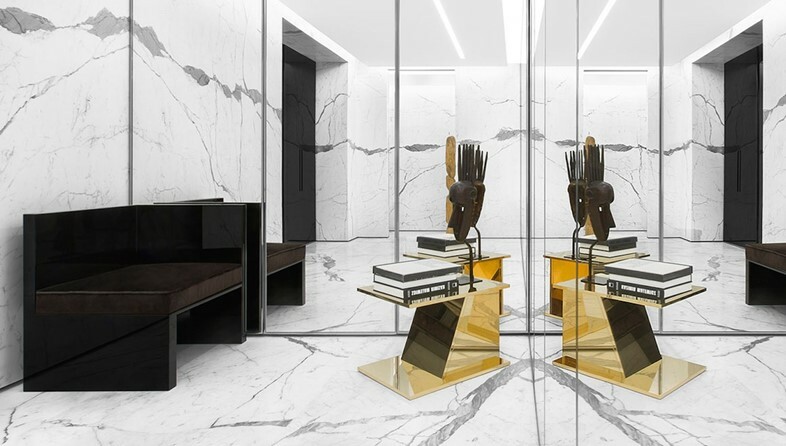 Favouring functionality above anything else, his avant-garde designs have always maintained a modern feel, while his eclectic style has become the quintessence of French luxury. Trained in Savoyard pottery, Jean Bernard concentrated on working with humble forms to create pure, modern designs. Coated with enamel, his clay pots, lamps and cups incorporated carvings, knurls and engravings of stylised foliage alongside repetitive motifs to achieve their signature aesthetic – plus, ever a design pioneer, he was among the first in the 1920s to employ the technique of shrivelled enamel. In line with the minimalism of his art, Besnard favoured simple colours like white, brown and turquoise, while gold was often used in the bands he would draw across his vases, which have since become a favourite of collectors around the world. A master at merging art with comfort, Théo Ruth was a Dutch furniture and interior designer whose functional and inventive pieces have become a symbol of Artifort’s design aesthetic. Since joining the world-famous firm in the mid-1930s, Ruth has worked alongside Pierre Paulin and Geoffrey Harcourt in the creation of timeless living room furniture, his most iconic piece being the 1952 Congo lounge chair, a perfect combination of style and brilliantly elegant construction. With an education in architecture, Alfred Porteneuve initially achieved renown within the 1920s Parisian art scene as the nephew and preferred collaborator of French Art Deco designer Jacques-Emile Ruhlmann. Often inspired by his uncle’s drawings, in his designs Porteneuve favoured lacquered wood, laminates and metal in opposition with softer materials like velvet and leather. Blending Art Deco stylishness with utilitarianism, André Sornay's creations are an exquisite union of exotic woods and industrial materials. Influenced by the synthetism of the Bauhaus and De Stijl movements, his dressers, chairs and tables were often made of rosewood, Oregon pine or Canadian orange-tinted wood, cleverly combined with simple plywood and aluminum. A promoter of clean lines and bold geometry, Sornay is considered to be the inventor of the assembling technique of “le cloutage”, as well as the first to incorporate lighting into his furniture. The French designer also developed the concept of system furniture: his cabinets would fold out to form four-seat dining tables and his practical floor lamps could also serve as small shelves. A lesser-celebrated talent but arguably the most groundbreaking of all, André Sornay was always a step ahead of his times.